Help Farmer George develop his farm. In such a big farm he is not able to do everything himself. So he needs your help! When you collect all the tomatoes from the field, immediately there will be other vegetables. You will always have a job. After a good harvest is good to build something. Maybe dovecote, cowshed or barn? George Farmer will tell for sure. 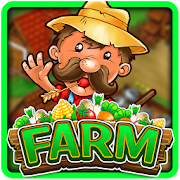 Real farm saga – you have to collect vegetables and develop a farm to unlock more fields. On each field will appear different vegetables that will need to be set at 5 or more of the same in a row, column or diagonal. In the upper right corner above the field you can always check the 3 vegetables will appear on your next move. Each field has his leading vegetable, whose you need to collect a certain amount in order to pass the level. The leading vegetable and its required amount is shown in the upper left corner over the board. After collecting the required number of leading vegetable the level will be counted and collected vegetables added to your basket. If you pass the level you can unlock the next field using tomatoes and if you fail you can play at the same level again.